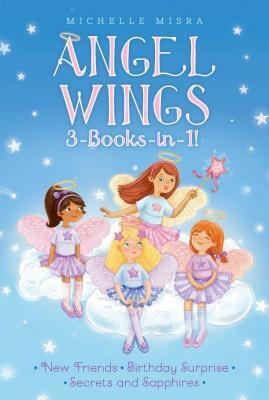 Join guardian angel-in-training Ella Brown and her friends as they experience magical adventures up in the clouds with this glittering paperback bind-up that includes the first three Angel Wings books! This sparkling paperback edition of the first three Angel Wings books includes New Friends, Birthday Surprise, and Secrets and Sapphires. In New Friends, Ella sets off on an adventure to Rainbow’s End, a magical place and home to the Forgotten Flower. Will Ella’s flair for trouble prevent her from earning her wings? In Birthday Surprise, Ella tries to cheer up homesick Jess with a magical glitter bomb. But her plan backfires, and Ella ends up destroying a priceless statue at school instead. Will Ella’s surprise get her expelled from Angel Academy? And in Secrets and Sapphires, an injured magical bunny shows up at school, and it's up to Ella to take responsibility for it. But could caring for the bunny give her the halo points she needs to join her friends in gaining a sapphire halo? Michelle Misra has written many stories for kids, including the Magic Ballerina, Battle Champions, and Wild Friends series. She lives in London, UK, with her family.